The UK has gone through enormous structural change over the last decade or so, with digital, e-commerce and technology at the heart of transforming the retail landscape. Additionally, lifestyle changes, coupled with our attitudes to shopping, which are more fluid, have led to some key behavioural shifts around where and how we shop. This article is based on a soon-to-be published report by AHDB’s Retail Insights team, titled ‘Changing Retail Landscape’. The UK retail landscape has undergone huge changes over the last few decades. Consumer attitudes to how we shop, where we shop and, indeed, lifestyle changes in general, have meant that retailers have had to evolve their offering in order to meet shopper needs. There have been many influences on purchasing patterns including the recession of 2008, the growth of online shopping and a move away from single big shops to doing smaller shops (but more often). Also critical is the growth of the hard discounters, which has led to changes in how the major grocery retailers operate, particularly around their promotional strategy, moving to more everyday low pricing. Then, of course, there is the uncertainty of Brexit and the likely implications in terms of prices, due to potentially higher input costs on the back of higher labour and raw material costs. This, coupled with continued pressure on real incomes, could lead to consumers seeking products that offer value, which is likely to further strengthen the position of the discounters. What has shaped how and where we shop? While we talk about changing consumer shopping habits and lifestyles, it is key to understand that the fundamental consumer wants and needs behind these trends have always been prevalent. The two main ones are the need for convenience and value for money. Historically, these needs can be linked to the reason why grocers came about. When looking at what factors determine where we shop, a convenient location is key. Convenient access is the reason why 57 per cent of consumers chose the last store they visited (IGD ShopperVista, Mission and Channel Choice Report, June 2018). This shows that physical availability is as important as mental availability and, no matter how well retailers differentiate themselves, the core requirement of access is vital to a consumer and store success. Value perceptions are the second driver of store choice. The introduction of grocers initially allowed prices to fall for consumers in comparison to what they were used to with independents, resulting in a highly competitive retail landscape. The 2008 banking crisis, which led to the great recession, challenged retailers further to think of innovative ways to offer ‘value for money’. 43 per cent of consumers chose the last store they visited because it saved them money (IGD ShopperVista, Mission and Channel Choice Report, June 2018). Aldi in 1990 and Lidl in 1994 opened their first stores in the UK, introducing a new concept for shoppers. While UK discounters such as Kwik Save and Safeway existed at the time (both with a market share of around 10 per cent each in 1995 – Kantar Worldpanel Till Roll 12 w/e 21 May 18), the cut-price model of the two German-owned discount supermarkets offered a stripped-back, no-nonsense approach to groceries which, after initial caution from UK shoppers, lured them in, particularly when the recession hit. Over the years, retailers have increasingly developed and marketed their own products rather than solely concentrating on brand names. Playing on a tiering system has allowed retailers to meet evolving consumer needs of differing price points by offering cheaper products alongside premium products for trading up. 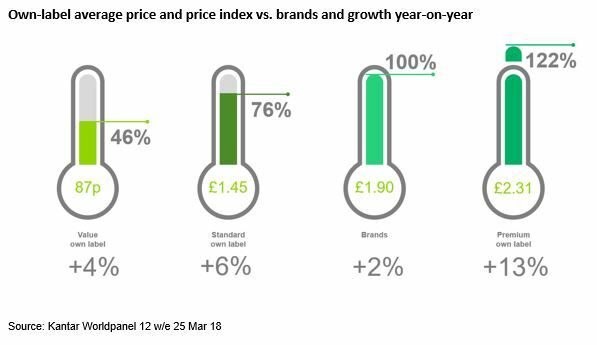 Now, more shoppers than ever are choosing own brands from supermarket shelves, with own label accounting for 50 per cent of UK grocery sales in the 52 weeks up until the 20 May (Kantar Worldpanel). Research published by Nielsen indicates growth in this area has been aided by favourable consumer perceptions around private label in terms of quality, price and range (The rise and rise again of private label, Feb 18). As competition has ramped up over the years, retailers have responded with promotions to stand out. There is no doubt that price promotions encourage shoppers to enter stores but there is the risk that retailers can become over reliant, hindering profit. Currently, 34.1 per cent of UK grocery value sales are sold on offer (Kantar Worldpanel, 52 w/e 20 May 18). While this figure is still significant, the market has seen promotional de-escalation since 2014, indicating a reversing retailer strategy. 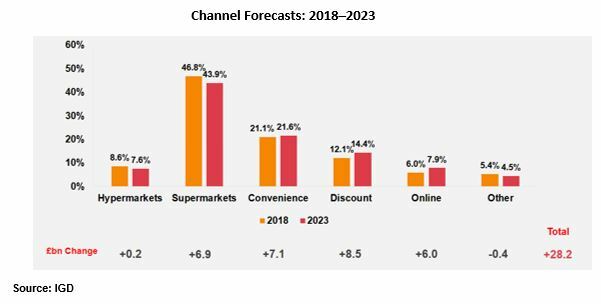 IGD predicts modest grocery market growth in the next five years of just over £28bn, mostly driven by grocery inflation, which will make it even more important for retailers and suppliers to understand the dynamics and opportunities by channel. Online and discount will account for more than half the increase in market value to 2023 but the outlook for larger stores has improved with investments in price, range and the customer experience helping them to better defend their market share. The retail industry continues to undergo significant changes. With shopper behaviour increasingly difficult to predict and growth harder to come by, retailers and manufacturers have been forced to adapt. Growth will come from retailers and manufacturers working together to better understand the evolving shopper dynamics at play and to deliver on those. Shopper experiences that drive emotional engagement will be key for time-pressed shoppers wanting to optimise their shopping routine. For agriculture, some of the key wins will be around developing products for different consumption occasions, better-targeted messaging and communication around growing trends such as health, the need for diversity and convenience. Supporting shoppers’ ethical credentials, especially with younger consumers, will also be key, so factors such as animal welfare and traceability are likely to become more important, given the increased availability of information and media coverage.